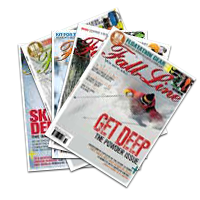 » Telemark Technique Tips » Drills - Improve Your Telemark Skiing in the Powder » As Featured in Fall Line Magazine. If you want one tip for telemarking the powder, the key to unlocking the door to powder paradise, the short cut, the fast route, one thing to crack it all, then this is it....are you ready? By the way, I’m giving this away far too cheaply. Let’s cut to the chase, here we go - Forget the Front Ski! Hang-on a minute. I’ve overlooked something. Being telemark skiers, you know there’s no short cut, no quick fix, no solve-it-all in a sentence. That technique Shangri-La doesn’t exist. You’ve done the hard yards, maybe still doing them, it can’t be that simple, surely? Actually, you’re right in both cases. Those ‘one-liner’ technique tips are great, you know the sort, we’ve all read them in books and memorised them until they become a mantra. They can provide those ‘light-switch’ moments when it all clicks, if you’ve got solid foundation skills. So ‘Forgetting the Front Ski’ is great, if you’re actually doing something with the back ski! There lies the secret, in the powder, you have to actively and accurately pressure, edge and steer the back ski, the moment you don’t, you’ll head plant. Want to learn how? This is a drill that will really get you working the back ski, it’s called the Pink Panther. Initially, practise it straight running on a flat slope. Once you’ve mastered that, then you can try doing it in a turn. In a turn you will go around the arc with the outside ski completely off the snow while the inside ski transitions from whole foot to heel up! In other words - you’re completely ‘forgetting the front ski’. Looking for that Powder Skiing Shangri-La? Here's the Key to Unlocking the Door. Start straight running on an easy uncrowded slope in a telemark stance. Initiate a lead change by unweighting and picking up the back foot while it’s moving forward. At this point you will be completely pressuring the front foot as it starts it’s transition to become the back foot. Keep the ski nice and high off the snow as you reach the mid point of the lead change, from now on your balance will become progressively harder as you move up onto the ball of the foot. Balance here is critical. Maintain a slow, smooth, balanced lead change, as your heal progressively lifts and the rear leg starts to flex into a telemark stance. All the while keep the front ski elevated off the snow. Try to place the front ski down slowly and silently. If you hear a loud slap as the front ski hits the snow, then notice that your balance is too far forward. When you can place the ski down slowly and quietly, focus on the sensation on your back leg, that’s exactly how it should feel in the powder. When you feel comfortable doing it in a straight run, then try doing it in a turn. See how far past the fall line you can place the front ski down. Try to get at least two-thirds of the way round the arc. When you can do this, you are truly pressuring, edging and steering the inside ski as it transitions from front to back foot. Coincidentally - you’re also completely forgetting the front ski! There you have it. Forget the front ski. Now go book those flights to Hokkaido, and don’t forget your snorkel!